He was the quintessential “Cool Cat.” Unfortunately for him (and us), it took him years to die. I think the tabloids had him killed off about twenty times. I know my Dean Martin death-watch file is bulging at the sides. A hugely sad, drawn out process. 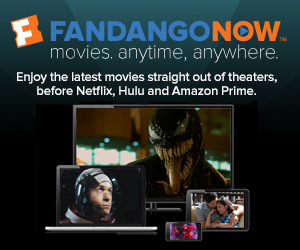 BUT – we all know that he was a fantastic singer and an accomplished actor, blah blah blah. He was great. No question about it. Also, no need to rehash. In 1987, Dean’s son Dino Jr., 35, star of the fabulous film Players (what, no Oscar? ), was killed in a National Guard jet crash. It is common knowledge that this incident was the beginning of the end for Dean Sr. The young Mr. Martin is buried in the Los Angeles Veteran’s Cemetery. 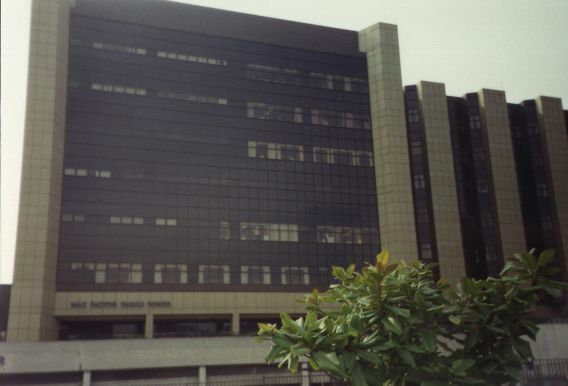 Skip ahead a few years, and on September 16th of 1993, Dean Martin went into Cedars Sinai Medical Center (photo courtesy of Terri Rios) for tests. Doctors found that his lungs were “riddled with tumors.” Supposedly, the doctors gave him only a few months to live. Dean walked out, and continued drinking and partying for over 2 more years. His agent, Mort Viner made a statement, “It’s obvious that Dean has resigned himself to facing death with a beer in one hand and a bottle of pills in the other.” Atta boy. You da man. Don’t you hate it when white people say that? 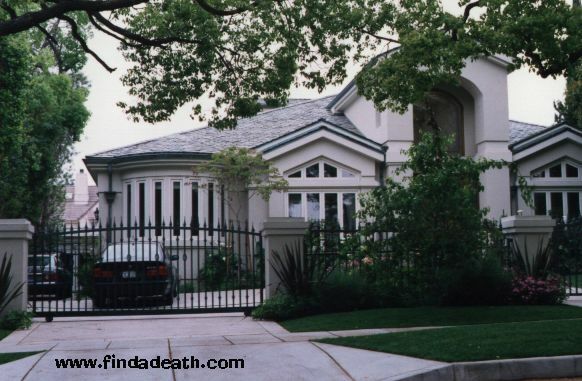 Dean continued to live in his home at 511 N. Maple Drive in Beverly Hills. Here’s another view of his house. They’ve trimmed the hedges back considerably. 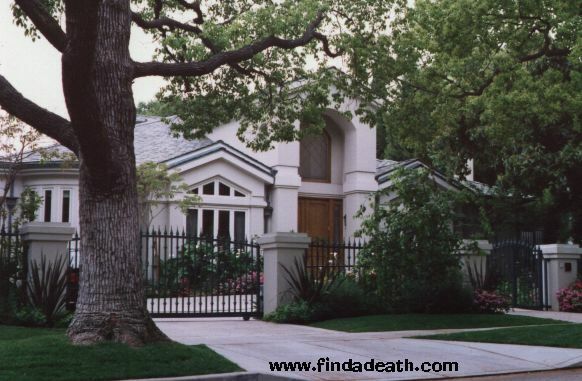 When Dean was alive, you could barely see the house. There are two conflicting reports about his death. One says that he spent his last evening alone, sipping red wine, and watching television until 2 a.m. The “help” heard him hacking, and knew he was restless, and in the morning, they checked on him, and found him dead. 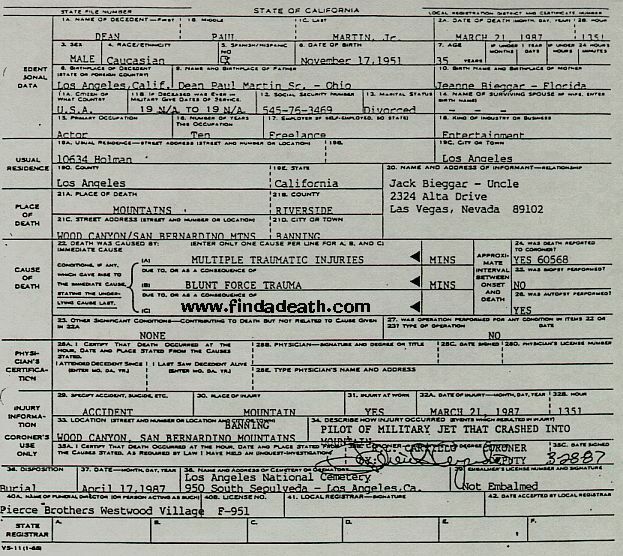 The other report came from his ex-wife Jeanne, who was still close with Dean. She stated that she was with him when he died, and then she crawled into bed with him, and just hugged him. Whatever the truth, on Christmas morning 1995, at 3:30 a.m., Dino passed away. The memorial service was held in the chapel at Westwood Memorial Park on December 28th. 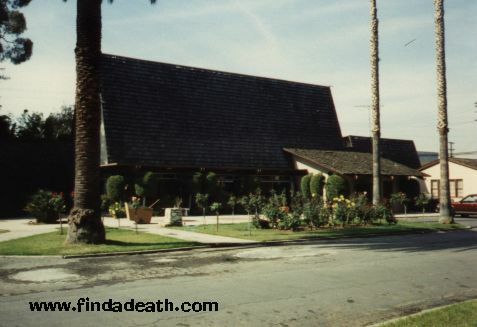 Just found out (Sept ’99) from Findadeath.com friend “Bob and Eight Avenue” that Dorothy Hamill was married to Dino’s son for a while, before (obviously) he was killed. Thanks for the info, Bob. 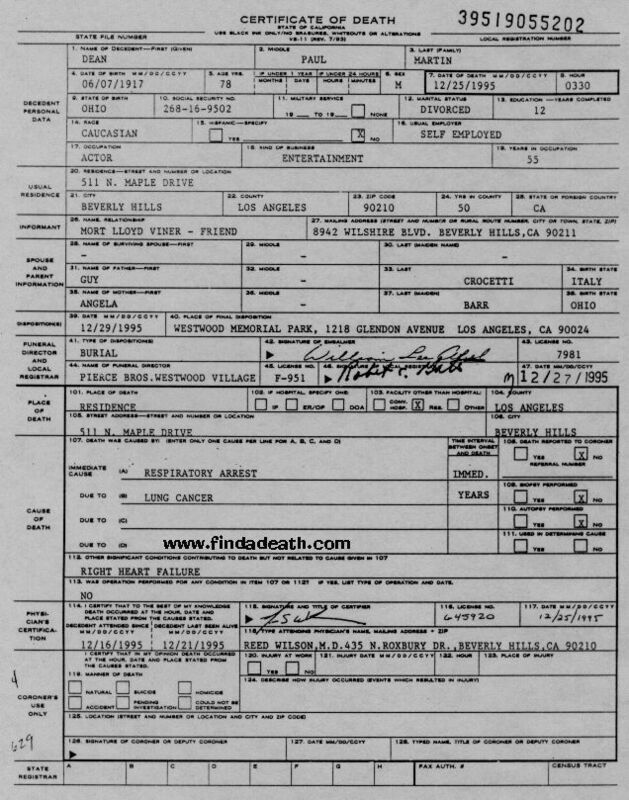 September 2001 – Findadeath.com friend Robert P sends this info about Charles Nelson Reilly: The reason C.N.R attended, C.N.R was a regular for 3 years on the old Dean Martin Variety Show in the 60’s. He was a close friend with Dean after the show ended. Also, I love your site!!! Thanks, Robert! Dean is interred in Westwood Memorial Park, near the graves of his parents. 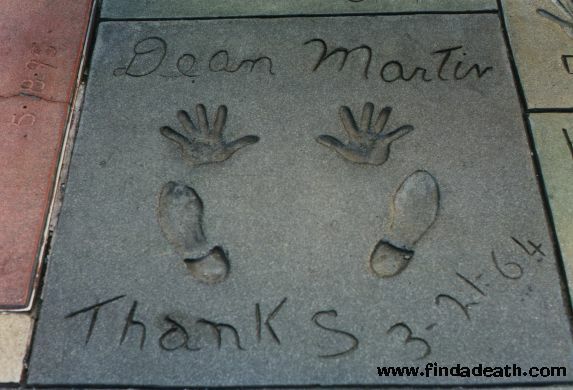 Trivia: On March 21, 1964, Dean placed his footprints in concrete, in the forecourt of the Chinese Theatre, in Hollywood. 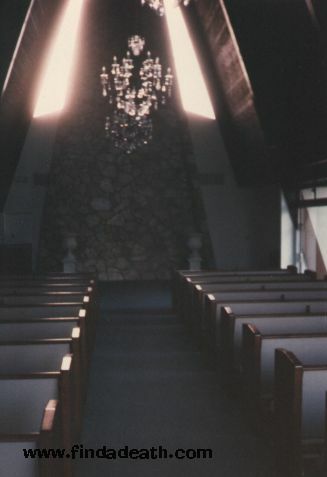 Trivia: Marilyn Monroe’s funeral was the very first to be held in this chapel. 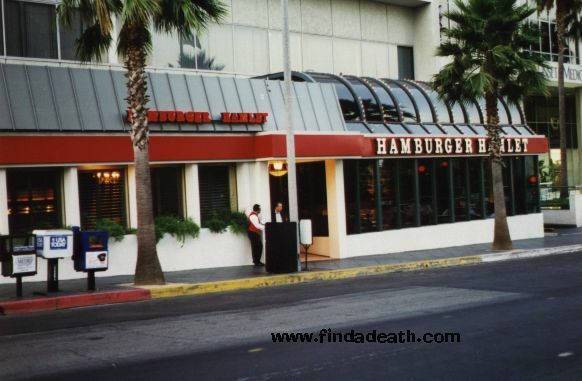 Mundane Trivia: I met Dean Martin in June of 1994, at the Hamburger Hamlet in Beverly Hills. He was having his ritual Sunday afternoon bowl of pasta and a glass of plain (I checked) orange juice. At the time, the OJ Simpson saga was in full swing, so Dino thought he was being very clever, asking for OJ. When I say these things, it’s the truth, not disrespect. He looked like hell. He was gaunt, and could hardly walk or talk. The worst was when he started to convulse and vomit. I honest to God thought he was going to go right then. But he didn’t. He recovered, so I strategically placed myself to block his view of the television, and it worked. Dino asked me to move, so he could see the TV. Dean Martin spoke to ME! So I moved. A few minutes later, the waiter comes up and says, “Mr. Martin would like to buy you a drink.” I almost died myself. The waiter brought me my Miller Genuine Draft Light (Yes, I saved it. ), and of course I had to thank him. I walked over to him, shook his hand, and spoke to him for a minute about his old co-stars Marilyn and Sharon Tate (I am not a hypocrite) and left, feeling pretty cocky. Though he wasn’t on top form, I got to meet Dean Martin. A moment I’ll never forget. Even More Trivia: Upon hearing the news of Dean’s death, Alan King quipped, “I’m going to have a drink right now for him.” AHAHAHAHAHAHAHAHAHAHAHAHAHAHA. Psh. January 2003, from Find a Death friend Captain America: Just surfed and enjoyed “fact finding” on your page….You should note that it was Dennis Wilson who wrote the words for “You are so Beautiful”, according to Jon Stebbins book “D.W.-the real Beach Boy”. Dennis also wrote with Daryl Dragon, before Dragon married Toni Tennille (Some of the songs on the Captain and Tennille’s first LP were Wilson / and or Beach Boy songs). 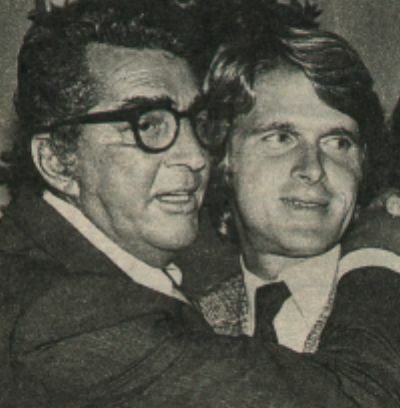 Also, you don’t mention that late Beach Boy brother Carl Wilson was the son-in-law of Dean Martin (Carl’s wife when he passed was Gina Martin Wilson). The Beach Boy/Dean Martin connection doesn’t stop there…Carl’s first wife was Annie Hinsche, sister of Billy Hinsche, member of the sixties trio…Dino, Desi and Billy!!! Billy later joined the Beach Boys touring band, and still supports the Carl Wilson walks against cancer. Carl’s son “Justyn Wilson” (by Annie) and Dennis’ son “Carl B.Wilson” (by Barbara) are members of the L.A. power trio “In Bloom”. February 2005, from Find a Death friend Max: Dino Martin Jr: He had also been married to Olivia Hussey, who starred as Juliet in Franco Zefferelli’s 70’s version of Shakespeare’s Romeo & Juliet (an incredible mind-warpingly sad version of the classic). 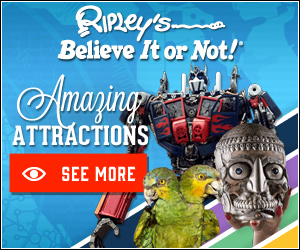 I believe they had a child, but my mind is failing me from staying up late at night, searching your website for gore! 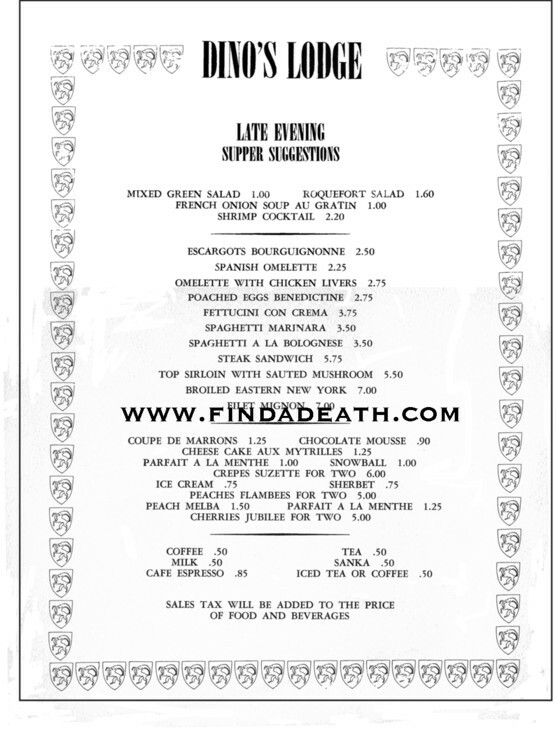 April 07 From Find a Death friend Lois: So I was sifting through some old papers and I found my mom’s old ‘Dino’s Lodge’ restaurant menu from the 60’s. It’s yellowed and crumbly but I scanned it to show you. But thought you would like to check this out!